Factory-welded clips are just one of the ways RHINO makes constructing metal buildings easier. We strive to make every RHINO bolt-up metal building go up simply using durable metal building parts. Whether you are a do-it-yourselfer constructing a detached garage or an experienced builder erecting a huge commercial project, you can depend on RHINO for problem-free construction. In a pre-engineered metal building system, steel columns, rafters and other metal building parts bolt together in frames to make the primary framing system. Girts attach from column to column across the length of the frames. Purlins attach from rafter to rafter across the roof of the frames. This makes up the secondary framing system. RHINO steel buildings have ¼-inch thick steel “clips” welded strategically on the columns and rafters. These clips are used to fasten the girts and purlins to the primary framing. What are the Advantages of Factory-Welded Clips? Since the clips are drilled and welded into place at the factory, locating the girts and purlins is a no-brainer. You simply attached the girt or purlin to the pre-welded clip. Other steel buildings supply bolt-on clips. That is just another step for you to handle at the job site, slowing down your project with more metal building parts to keep track of. Properly welded clips are stronger than bolt-on clips. Other companies may send a package of steel plates for you to drill, position, and weld in the field. 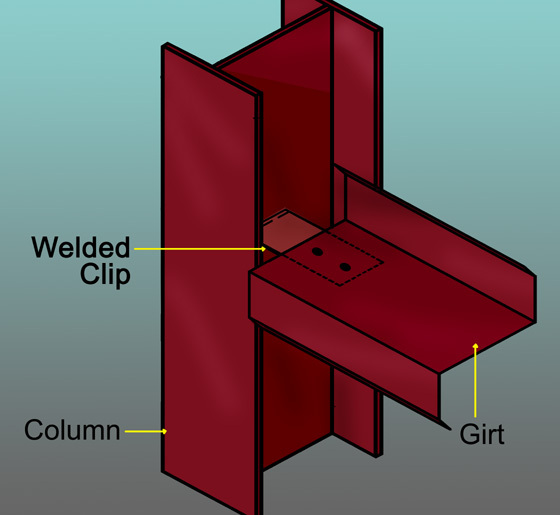 Field clip installment is not only time-consuming, but requires a qualified welder. In some locations, this could also mean all the welding joints must pass building inspection. If all the bolt-on clips, steel plates, or other metal building parts are not in the framing package, construction is delayed while you wait for more to arrive. Who needs that hassle? Larger structures like warehouses may require installing two hundred clips or more in a system without pre-installed factory-welded clips. The more your crew must do in the field, the longer it takes to construct the building— and the larger the chance for human error. 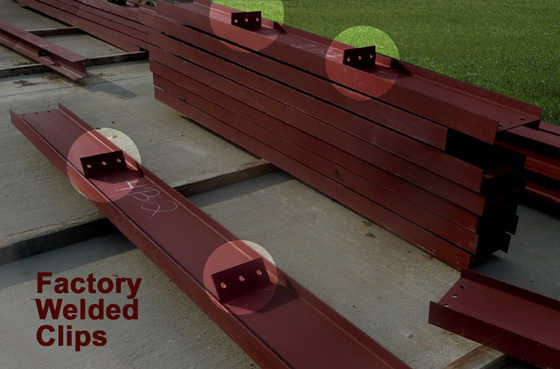 Factory-welded clips eliminate costly job site mistakes. Pre-engineered metal buildings take the guesswork out of construction. Each building is designed to use as few pieces as possible to build the strongest structure for that purpose and location. Manufactured under strict quality-controlled standards, each project arrives cut, welded, drilled, marked, and ready to start assembling. RHINO’s prefabricated steel building system reduces construction time by 33% or more. What Can We Help You Build Today? Our goal is to make every RHINO steel building project arrive on time and on budget. Supplying excellent service and a trouble-free product is part of the RHINO Difference. We want you to return to RHINO for more steel buildings— and to feel confident in recommending RHINO to others. In the past twelve months, 39.1% of our sales came from repeat customers and referrals. Contact a RHINO metal building specialist right now for information on clips and our superior bolt-up metal buildings. Call us at 940.383.9566 for more details and a free no-obligation quote. Share the post "How Metal Buildings with Factory-Welded Clips Save Time"